Home » About Us » Statement of Purpose » What Are the Building Blocks? High performing primary care practices vary in size, resources, staffing, and populations served. Yet they exhibit surprising similarity in how they provide high quality, accessible, and patient-centered health care. These similarities are what we identify as the Building Blocks of High Performing Primary Care. These Building Blocks were derived from site visits to high-performing primary care practices and clinics in 2010–2011. The unanimity with which these principles are put into practice suggests that there is one basic model – with individual variation – for primary care excellence. The Building Blocks form the scaffolding for our practice transformation work with clinics and are the basis for our practice coaching curriculum. 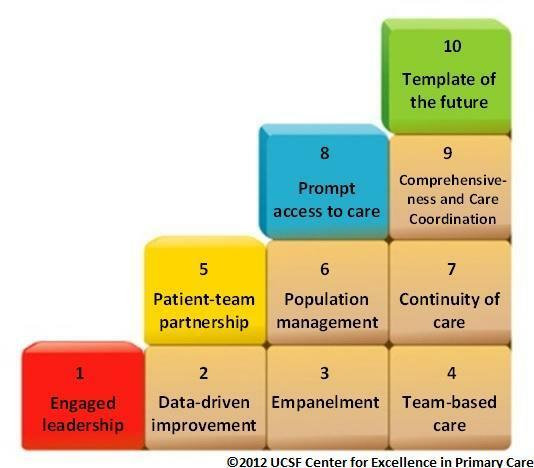 Read our California Healthcare Foundation report for detailed descriptions of how practices have put six of these blocks into practice: The Building Blocks of High-Performing Primary Care: Lessons from the Field, April 2012.